A man riding a scooter died Friday after he was hit by an SUV at Dupont Circle. News4's Aimee Cho reports. A man riding an electric scooter was hit by an SUV and killed at Dupont Circle on Friday, marking D.C.'s first fatal scooter crash since the vehicles appeared on streets about a year ago. Carlos Sanchez-Martin, 20, of Silver Spring, Maryland, died after he was hit Friday morning on the southwest side of the circle, near a CVS Pharmacy. "When you know something that bad, it's just a big blur," said a witness, who declined to give his name. Firefighters scrambled to free the man from beneath the SUV. After 15 minutes, they were able to rush him to a hospital, where he died. 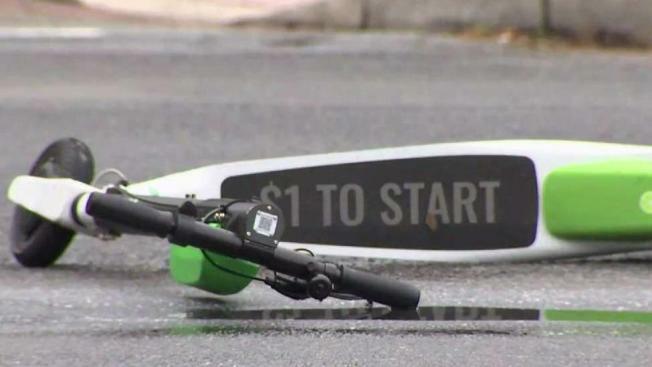 For hours, a Lime electric scooter, a pair of headphones and a single shoe remained at the crash scene. The SUV driver cooperated with police. It was not immediately clear if the driver would face any charges. D.C.'s police chief said Friday afternoon that officers were reviewing surveillance footage for clues about what happened. Lime said in a statement that the company was "deeply saddened" by the man's death. "Our thoughts and sympathies are with the family and loved ones. We have offered our full support to local authorities in connection with the investigation," the statement. The vehicles can zip around streets at 14.8 mph, Lime's website says. Both Lime and the D.C. government recommend that scooter riders wear helmets, but the city does not require them. D.C. law requires electric scooter riders to be 16 or older. The vehicles can be ridden on some sidewalks and in bike lanes. The U.S. Consumer Product Safety Commission lumps in data on electric scooter injuries with hoverboard injuries, according to information provided by emergency rooms. Between Jan. 2013 and Aug. 2018, more than 95,000 people went to emergency rooms for electric scooter or hoverboard injuries. Fractures were the most common type of injury.